So much yarn, so little time. 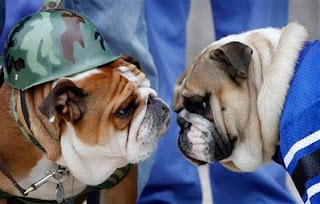 : Beautiful Bulldogs??? Although I don't want to offend the dog-lovers amongst you, I'm a cat person. For three years (according to Yahoo news) Porterhouse was so close to the title he could drool on it. 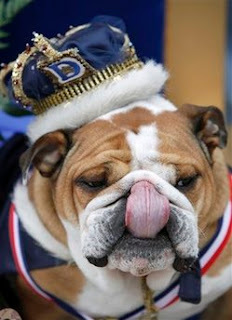 Now, the Beautiful Bulldog crown is his to slobber on for the rest of the year. The mind boggles... Hope I don't have nightmares tonight! OMG...I will have to show the people at work. MY friend at work baby sat a bull dog BUBBA! she brought him to work. He was so mellow! This is too cute!! Those faces -awww. The getups - wow. LOL, too funny! I'm a dog and a cat person (have one of each), but can't say these pics win me over. haha! The 3rd one down is rather on trend right now...if you were in my little class of 10 year olds anyway! I too am most definitely a cat person! love it! you are something else! 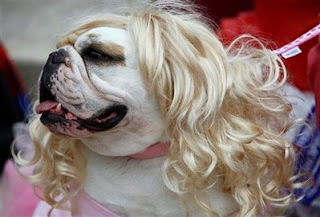 Can't help thinking that these dogs will be scarred by this lol. 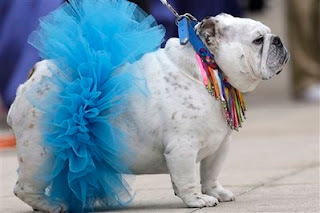 I would love to see the owners wearing the same outfits. Can't help thinking that these dogs will be scarred by this. 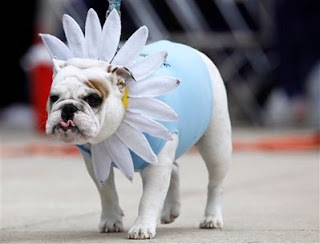 Would love to see the owners wearing those outfits lol.